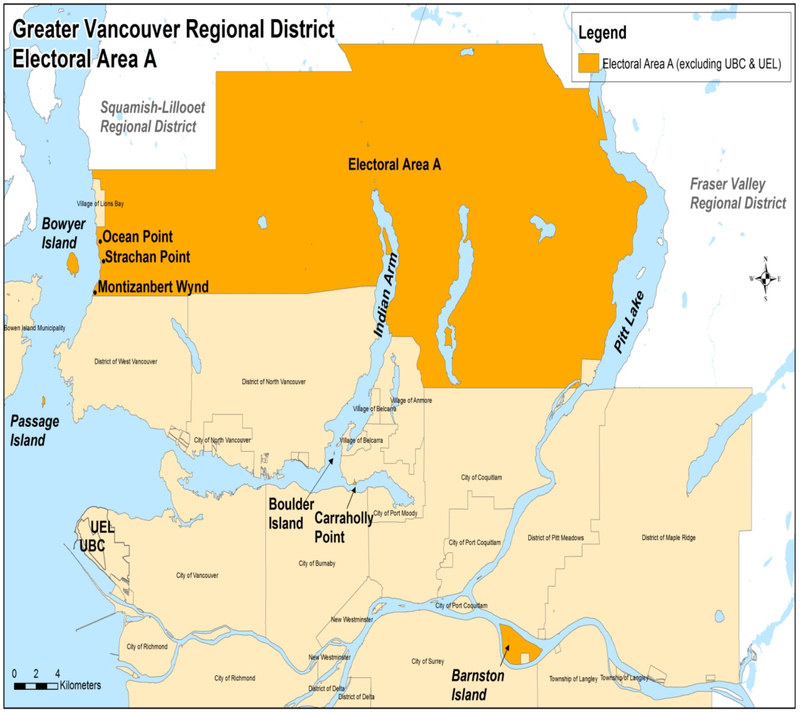 The South Fraser Blog: What the heck is Electoral Area A in Metro Vancouver? 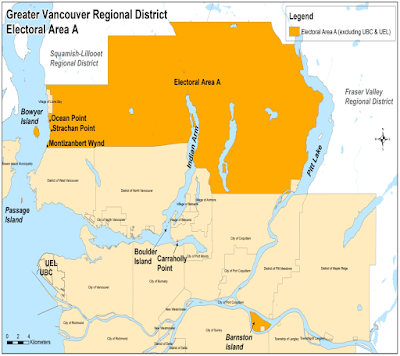 What the heck is Electoral Area A in Metro Vancouver? A few weeks ago, I was chatting with some people that work in the urban planning and civil engineering for municipal government in our region. Somehow we got on the topic of Electoral Area A in Metro Vancouver. There was a lot of questions about Electoral Area A that I answered. In Metro Vancouver, 99%+ of the population lives in a municipality or Tsawwassen First Nation land. For the 99%+, Metro Vancouver delivers regional services and land-use planning as agreed upon by municipalities in the region. Municipalities appoint directors to the Metro Vancouver board. You can see what services are delivered by various levels of government on an infographic I commissioned a few years ago. There are some exceptions in the region. As of the 2011 census, some 13,035 people live in Electoral Area A. Metro Vancouver acts as a quasi-municipality to most people that live in Electoral Area A. If you live in this area, you elect a director to the Metro Vancouver Board. The following is a map of Electoral Area A. A map of Electoral Area A. Select map to enlarge. Electoral Area A also includes the University Endowment Lands and UBC itself, but Metro Vancouver doesn’t provide any municipal services in these areas. A map of the University Endowment Lands. Select map to enlarge. The University Endowment Lands (UEL) is directly managed by the provincial government. The province provides all municipal services in the UEL. 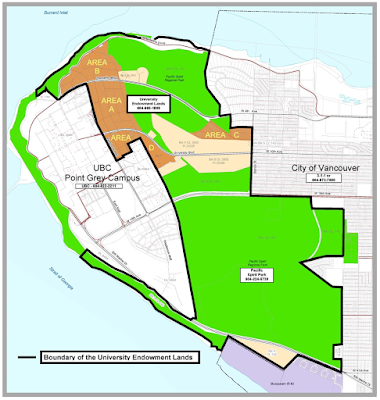 A map of areas at the UBC Campus where people are represented by the University Neighbourhoods Association. Select map to enlarge. If you happen to live on leased land at the UBC Campus such as Wesbrook Place or Hampton Place, you elected and are represented by the University Neighbourhoods Association. The society provides some local services such as community centre access, landscaping, streetlights and basic road maintenance. At the end of the day, the UBC Board of Directors has ultimate control in that area. While the vast majority of people living in Metro Vancouver are represented by an elected municipal council, there are some exceptions in the region. Please note that I didn’t talk about people that live on land within federal jurisdiction.